A Winona, Minnesota-based foundry called Alliant Castings is using a Cosine Additive AM1 large scale 3D printer to do pattern making for their production fulfillment. The industrial-grade 3D printer enables them to fabricate pattern molds at a fraction of the cost of a traditional pattern maker while saving them time as well. The AM1 is not your standard 3D printer. It can build parts as large as 1,100mm x 850mm x 850mm, and it uses machined ballscrews, an advanced motion controller, and high-end servo motors to achieve 50nm positional accuracy and movement speeds of up to 250mm/s. The extruder can receive spooled filament and plastic pellets, and it can reach 500°C, allowing it to handle every material and polymer mixture. Using filament, dual and tandem extruding is also possible. Using the pellet extruder, the AM1 can output 20 pounds of material per hour, a blistering rate. The aluminum bed heats up to 200°C and the build chamber can be held at 100°C, reducing warping and shrinkage. 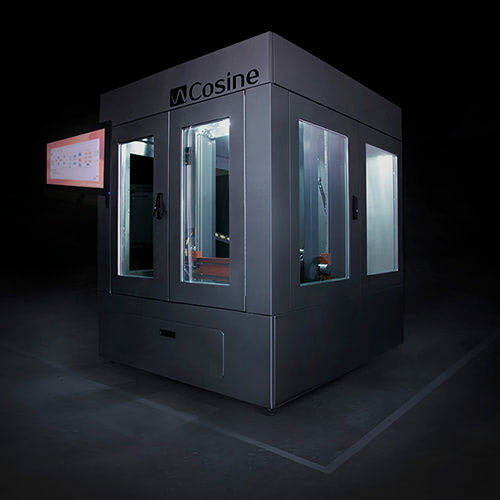 The Cosine Additive AM1 is a large scale, material extrusion 3D printer.